Vacation to East Nusa Tenggara Indonesia as if you are on vacation to another planet. Yes, because here you will find things that are truly amazing and amazing that one of them is Whale Hunting In East Nusa Tenggara Indonesia. This area is located in Lamalera Village, Lembata District, East Nusa Tenggara Province, Indonesia. For a while forget a moment of modern civilization in your place and start the adventure in the amazing outdoors at the whalers village of Lamalera Village, East Nusa Tenggara Province. This place has incredible natural beauty, cultural uniqueness, culinary good tasty and public hospitality. One of the action tours that you can enjoy in East Nusa Tenggara Indonesia is whale hunting. In addition to visiting traditional Whale Hunting Culture Tour with some rituals performed, you can also enjoy the beautiful panoramic beaches located in the village of Lamalera Indonesia. Here you can watch the whole series of traditional traditions ceremonies, see the traditional whale spear equipment, in the residential complex housing and the cultural attraction packages organized by the local community and blend in with the friendly community. 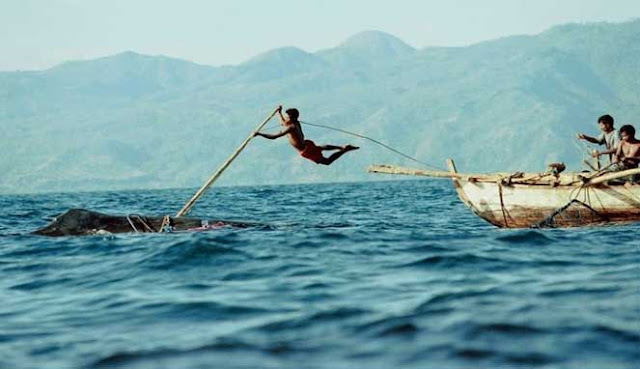 The Indonesia whales hunting attraction in Lamalera Village, East Nusa Tenggara Province only uses traditional Whale spear equipment such as Peledang (wooden boat without engines) and Temputing (steel-related spears) used for stabbing whales. Before Whale Hunting In East Nusa Tenggara Indonesia, you will be served with the ceremonial attractions of Adat Tobo Fata name (rite of settling tribal and landlord problems before hunting whales). rite of le Gerek in the whale by the Langowujo landlords usually done on 29 April each year. And on May 1st it was followed by the Leva Mass with a religious tradition to ask God for blessings on the Leva season that began on May 2nd until September 30th of each year. 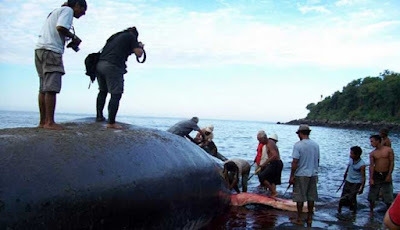 If you are interested, Whale Hunting In East Nusa Tenggara Indonesia will take place from 2 May to 31 October every year. While the preparation of the ritual began on 29 April with the ritual performed "Tobu Name Vate" or rite between fishermen and landlords in the Pope on May 1, held the opening Mass Leva (sea). If you want to spend the night in Lamalera Village, there is homestay Felmina Homestay, Ben Homestay and Maria Homestay with a delicious local food menu. To be able to Hunting Indonesia Whale In Lamalera Village can be reached from the city of Lewoleba using land transportation with the travel time of about 3-4 hours.